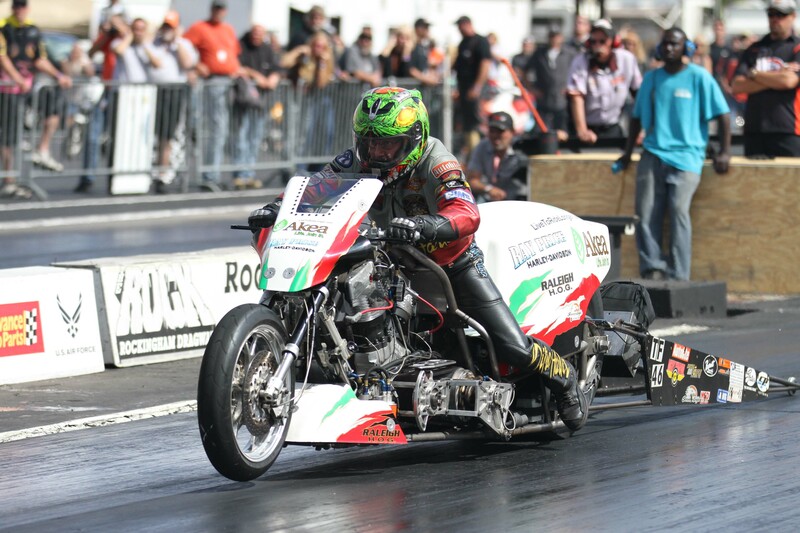 Ray Price racing traveled all the way to Mission Raceway in Mission, British Columbia, Canada, to attend the eighth race in the NHRA Harley-Davidson Drag Racing Series this past weekend. The team tested on Thursday to prepare the 1,000 horse power nitro Harley for the first rounds of qualifying on Friday and Saturday. The team was pleased with the test pass when the drag bike ran an incredible 6.284 ET at 232.74 MPH! “After the test pass we feel really good about going into qualifying and look to putting down some strong numbers, Ray Price commented after the test session. During Friday’s first qualifying pass, Grimes put down another solid pass running a 6.319 ET at 234.19 MPH. Both the test run and first qualifying pass set a new Mission Raceway track record. Then in the second round the bike spun the tire and Grimes shut down early. However, in the third round, the team came right back and laid down an electrifying 6.272 ET at 234.55 MPH to capture the number one qualifying spot. The team had the Akea Express top fuel Harley ready and tuned for Sunday’s eliminations. Even though they had a bye run, Grimes did not let up and ran a 6.350 ET at 232.67 MPH. Then in the second round of eliminations, the Akea Express spun the tire, but fortunately Grimes still won the round because Nate Gagnon’s drag bike broke its chain, and Grimes was able to cross the finish line first. Grimes faced Damian Counden in the finals, both riders left the start line hard, it was a close race until the eighth mile, when Counden spun the tire on his drag bike, then Grimes pulled ahead and ran strong all the way to the finish crossing the line with a 6.346 ET at 232.01 MPH to capture the teams fifth win of the 2014 season. “The Akea Express ran so consistent all weekend. This win was a total team effort, and it was worth traveling across the country to get our fifth win”, Ray Price commented after the win. The teams next race will be Shakedown at Summit, an exhibition event at Summit Motorsports Park, Norwalk, Oh, October 3-5, 2014. The Ray Price Motorsports team sends sincere thanks to all their sponsors for their support for the 2014 race season. They include our Primary Sponsors: Akea, Ray Price Harley-Davidson, with special thanks to our Associate Sponsor Raleigh H. O. G. and our Support Sponsors: CP Pistons, Vanson Leathers, PJ1 Products, RC Components, Nationwide Insurance, Royal Purple, Barnett Clutches & Cables, Autolite Sparkplugs, Mickey Thompson Tires, Gates Belts, Brown and Miller Racing Solutions, JIMS USA, Industrial Machine Solutions and Wiley X. Additional thanks: Bill Hayes, Hargis Consulting, Ultra Pro Machining and Freddie Robbins.